Winner of the 2018 Distinguished Book Award from the Communication and Social Cognition Division of the National Communication Association. 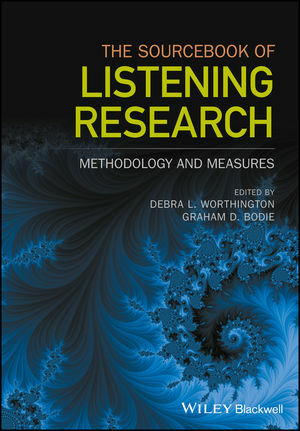 Essential reading for listening researchers across a range of disciplines, The Sourcebook of Listening Research: Methodology and Measures is a landmark publication that defines the field of listening research and its best practices. DEBRA L. WORTHINGTON is Professor and Associate Director for Communication at Auburn University, USA. She is the principal author of the leading textbook Listening: Processes, Functions, and Competency (2011). She has published numerous research articles on listening - particularly as related to measurement and individual listening style. Her research has been recognized by the International Listening Association, the American Society of Trial Consultants, the European Communication Research and Education Association, the National Communication Association, the Eastern Communication Association, and the Southern Communication Association. Worthington has received the Ralph G. Nichols Listening Award (International Listening Association) and the Burton Award for Legal Achievement (Burton Foundation), and is a past president of the International Listening Association. GRAHAM D. BODIE (PhD, Purdue University), formerly Professor of Communication Studies at Louisiana State University and Agricultural & Mechanical College, is now on faculty in the Meek School of Journalism and New Media at The University of Mississippi. His research on listening and the social cognitive underpinnings of human communicative behavior has been published in Human Communication Research, Communication Monographs, Communication Research, Communication Yearbook, and the International Journal of Listening, among other outlets. Graham's research has been funded by the Louisiana Board of Regents and the National Science Foundation, and he regularly appears in local and national media outlets on issues relevant to listening in close relationships.